Wow! 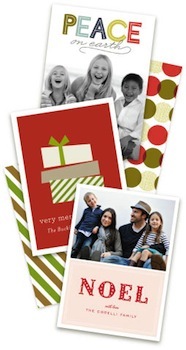 Now is the perfect time to order your holiday cards at Minted.com. You can get $50 off your $50 holiday card purchase. To get your discounts, just follow the instructions below. Sign up for a Minted account to get a $25 credit. To verify that you’ve received the credit, check your referrals page. Enter your name and email address to get a coupon code for $25 off a $50 purchase. Create your cards and enter the coupon code you were given in step 2. The $25 credit should come off automatically, leaving you with $50 in free items! Shipping starts at just $7.95. That’s an awesome deal for some high quality photo products! This deal is only valid through 11/4/12, so grab your photo cards now if you’re interested.